With characters and settings removed from everyday reality, Miss Lasko-Gross has set out with “Henni,” published by Z2 Comics, to tell a fable about faith in a most stripped down manner. Henni, our main character, like all the rest of the characters, is some sort of feline creature. She lives in something like a grim version of a Dr. Seuss world. The rules of society are cut and dry: obey and don’t ask questions. And, by all means, especially if you’re a female, follow orders. 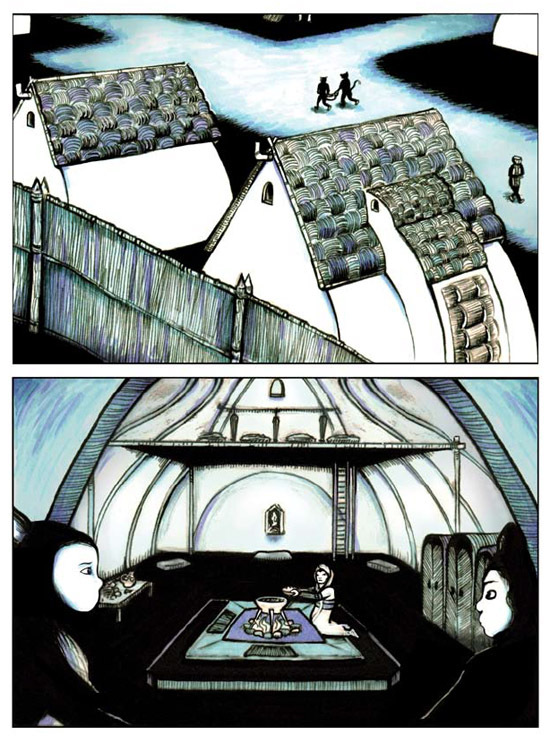 Your eye is directed to a graphic novel with a distinctive focus in a pared down surreal landscape. Much like her father, Henni doesn’t take too kindly to just following orders. Unfortunately, for her dad, this leads to him vanishing one day, byway of the authorities. Years later, when she is of the age of consent, she decides to bolt out of town instead of succumbing to the docile life already planned for her. Miss Lasko-Gross has written and drawn quite an engaging story. She is part of that special group of cartoonists, typically independent or self-published, who writes, draws, pencils, inks and colors her own deeply personal stories. Enjoying a career dating back some twenty years, Lasko-Gross was acknowledged early on as a rising talent and has been published by Fantagraphics Books. For “Henni,” published by the boutique graphic novel publisher Z2 Comics, she brings an offbeat sensibility years in the making. Henni, is essentially anyone, especially a young woman, confronting the powers that be. This is a story about the limitations imposed upon others. It’s also about the rules that people blindly follow and those among us, like Henni, who dare to rebel. Told in a quick and steady pace, this graphic novel manages to avoid being dogmatic. The artwork has a nice and simple quality to it. I would say it’s a jump into a realm not too distant from Dr. Seuss, or Jim Woodring, for that matter. Lasko-Gross keeps the tempo ticking back and forth with a two panel per page approach. She favors a duo-tone coloring. And, most interesting, she has essentially neutralized the sexuality to the characters. These are smooth and furry animals, of course, staples of comics and perfect symbols for telling a story that is determined to avoid distractions. 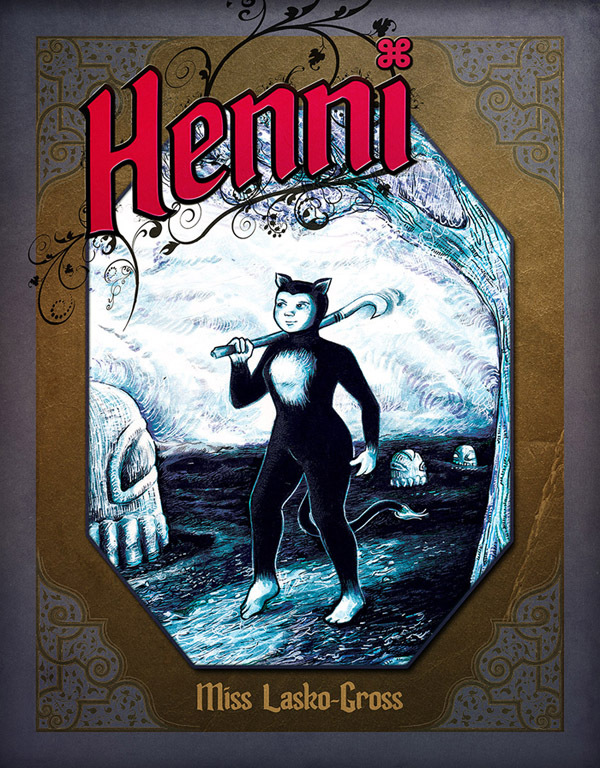 “Henni” will strike many readers as a wonderful call to action and could become someone’s new favorite coming of age tale. As we reach the close, there’s hints of more to come so you’ll likely read more about Henni in the future. I love the artwork. The story makes me think of my time in Saudi Arabia, where everbody’s like is planned, especially women. And their conversations about wanting to be educated in the UK or US. While it’s their normal, they yearn for different and often did things that were haram (sinful). And almost anything was haram. It was interesting but I was so glad when my plane landed in the ATL. Thanks for sharing that! Yes, similar thoughts come to mind. The work here does a great job of addressing these issues.